Air pollution is the single largest environmentally-related global health risk. One quarter of the global population is breathing unsafe air and 7 million people die annually from diseases related to air pollution (according to the WHO). Most of these emissions also contribute significantly to climate change. Air pollution is a critical problem for many cities, particularly due to the concentration of transport, but also heating in buildings and fossil-fuel powered industries. Countries experiencing major air pollution problems include China and India, however major cities around the world are experiencing significant air quality problems, including Riyadh, Karachi, Cairo, Mexico City, Istanbul & London. Many cities in South Asia suffer pollution levels more than 10 times higher than the safe threshold. 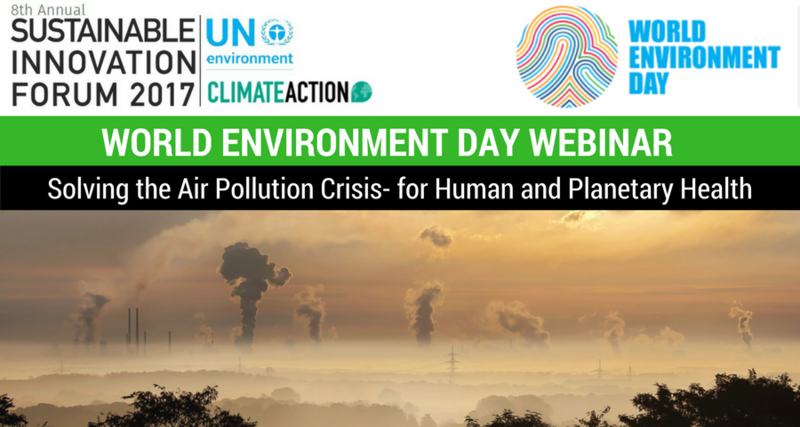 This webinar was held ahead of the Sustainable Innovation Forum 2017, taking place alongside COP23 in Bonn (13-14 November), and gathered influential experts that are trying to tackle the problem of air pollution to discuss their strategies, potential solutions, and optimal pathways to reducing air pollution and its impact on both human and planetary health. The IEA has concluded that global air pollution needs to be cut by 50% by 2040 in its Clean Air Scenario. What actions need to be taken now? What are the most effective policies to reduce air pollution in cities? How crucial is air quality data collection? Measuring in order to manage. How can technology support cities in finding local solutions to air pollution? And anyone interested in breathing cleaner air!